When you Normal or Special Summon a "Secret Six Samurai" monster(s) (except during the Damage Step): You can Special Summon this card from your hand. You can only use this effect of "Legendary Secret of the Six Samurai" once per turn. Once per turn: You can banish 1 Level 4 or lower "Six Samurai" monster from your GY; until the end of this turn, this card's Attribute, Level, and ATK/DEF become the same as that banished monster's. This monster is the armor of Great Shogun Shien possessed by its spirit. 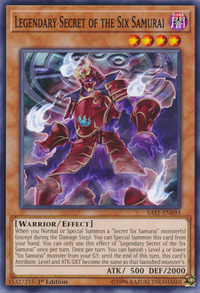 This card's artwork is similar to that of Spirit of the Six Samurai. This card most likely pictures the results of the battle seen in Face-Off, Stand-Off, and Evenly Matched. Namely, it shows that Great Shogun Shien lost to Shadow of the Six Samurai - Shien".